In the spirit of celebrating Down Syndrome Awareness Month, we are excited to share another Team Spotlight. On Saturday, October 21st, the Grand Strand Down Syndrome Society celebrated its Fifth Annual Buddy Walk® event at Grand Park at Market Commons in Myrtle Beach, SC. Denise and Joe Brown, team captains for one of the top fundraising teams for GSDSS, Team Jack the Great, were happy to share their story with us. Team Jack the Great was formed in honor of Denise and Joe’s son Jack, who has a twin brother, Evan; the boys recently celebrated their first birthday. Jack loves bananas, the Noisy Farm book, and the movie The Secret Life of Pets. Jack is now crawling and pulling up, and Evan has provided the motivation to help push his brother. 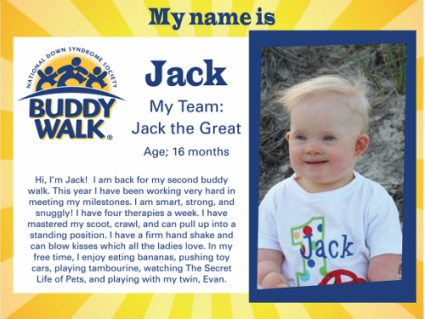 Jack tries his best to keep up with his brother, who is now walking. .
Jack was just six months old at the 2016 Grand Strand Buddy Walk®, but the Browns first connected to the GSDSS while the twins were still in the NICU. Joe discovered the organization when he searched online for information regarding Down syndrome, and after a brief discussion, the Browns decided to create a team for the 2016 Grand Strand Buddy Walk®. In the short period of time from the twins’ birth, Denise and Joe had tried to absorb as much knowledge as possible regarding Down syndrome, but they felt they were probably still “clueless.” They thought it would be beneficial to get involved with the event, as they would have an opportunity to meet other families on the same journey. “We needed to meet all these great people with Down syndrome,” Denise shared. Denise’s favorite memory of the walk was the feeling of overwhelming support and love. Their families and friends rallied for Jack, and they raised a “surprising amount of money.” It eased some of Denise’s concerns to see all of the support from so many people. This year, for their second Grand Strand Buddy Walk®, Team Jack the Great raised $3575 for the Grand Strand Down Syndrome Society! We’ll look forward to watching the team’s efforts grow along with Jack and Evan.